Bisphosphonates are synthetic compounds characterized by a P–C–P group, and are thus analogs of inorganic pyrophosphate. They are used in medicine mainly to inhibit bone resorption in diseases like osteoporosis, Paget's disease and tumor bone disease. They have been used for over a century in industry, and only in 1968 was it shown that bisphosphonates have biological effects. These effects consist mainly of an inhibition of bone resorption and, when given in large amounts, an inhibition of ectopic and normal calcification. While the latter effect is the consequence of a physical-chemical inhibition of calcium phosphate crystal formation, the former is due to a cellular effect involving both apoptosis of the osteoclasts and a destruction of the osteoclastic cytoskeleton, inducing a decrease in osteoclast activity. 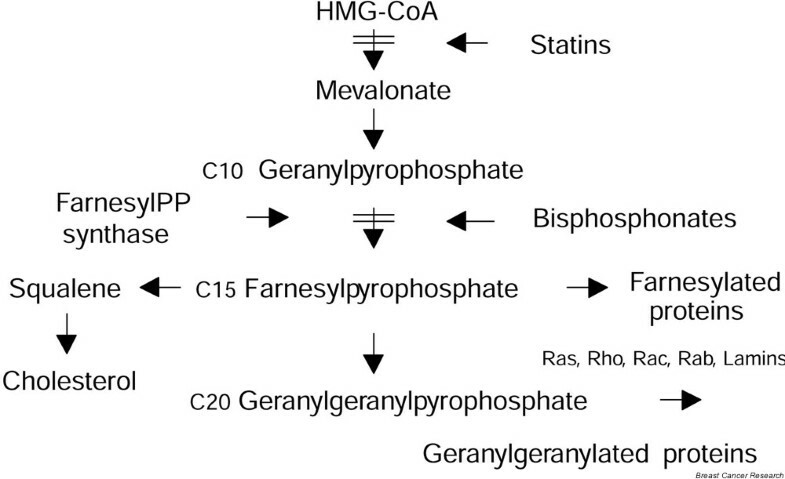 The biochemical basis of these effects for the nitrogen-containing compounds is an inhibition of the mevalonate pathway caused by the inhibition of farnesylpyrophosphate synthase, which leads to a decrease of the formation of isoprenoid lipids such as farnesylpyrophosphate and geranylgeranylpyrophosphate. The other bisphosphonates are incorporated into the phosphate chain of ATP-containing compounds so that they become non-hydrolyzable. The new P–C–P-containing ATP analogs inhibit cell function and may lead to apoptosis and death of osteoclasts. The bisphosphonates, in the past erroneously called diphosphonates, have been known to chemists since the middle of the 19th century, the first synthesis dating back to 1865 in Germany . Their use was industrial (mainly in the textile, fertilizer and oil industries) and, because of their property of inhibiting calcium carbonate precipitation, as preventors of scaling. Our knowledge of the biological characteristics of bisphosphonates dates back 30 years, the first report about them, actually by the present author's group, having been presented in 1968 . The concept was derived from earlier studies in our laboratory on inorganic pyrophosphate , in which it was found that plasma and urine contained compounds inhibiting calcium phosphate precipitation in vitro and it was found that part of this activity was due to inorganic pyrophosphate, a substance that had not been described previously in these fluids. We then found that pyrophosphate also inhibited calcium phosphate dissolution in vitro. In vivo, this compound prevented ectopic calcification but had no effect on normal mineralization and on bone resorption, possibly because it was destroyed locally by phosphatases. This prompted us to look for analogs of pyrophosphate that were not destroyed enzymatically. The bisphosphonates fulfilled these conditions [4, 5]. Bisphosphonates are compounds characterized by two C–P bonds. If the two bonds are located on the same carbon atom the compounds are called geminal bisphosphonates (although usually just bisphosphonates), and they are analogs of pyrophosphate that contain an oxygen atom instead of a carbon atom (Figs 1 and 2 show two bisphosphonates used in tumor bone disease). The P–C–P structure allows a great number of possible variations, mostly by changing the two lateral chains on the carbon. Small changes in the structure of the bisphosphonates can lead to extensive alterations in their physicochemical, biological, therapeutic, and toxicological characteristics. Many bisphosphonates have been investigated in humans with respect to their effects on bone, and eight of them are commercially available today for treatment of bone disease. As is the case for pyrophosphate, most of the bisphosphonates inhibit the precipitation of calcium phosphate even at very low concentration . Bisphosphonates also slow down the dissolution of these crystals . All these effects appear to be related to the marked affinity of these compounds for the solid-phase calcium phosphate to which they bind . The fact that bisphosphonates inhibit calcium phosphate crystal dissolution in vitro led us to hypothesize that these compounds might also act on bone resorption in vivo. The hypothesis of an effect on bone destruction proved correct, but the mechanism of action is different from that originally conceived. In vitro, bisphosphonates decrease the destruction of bone in embryonic long bones and in neonatal calvaria . An inhibition can also be found when the effect of isolated osteoclasts is investigated on various mineralized matrices in vitro. In vivo, bisphosphonates inhibit bone resorption both in normal animals as well as in animals in which bone resorption is stimulated experimentally, for example with parathyroid hormone , retinoids and others. Thus, in growing rats, bisphosphonates block the degradation of both bone and cartilage, and thus arrest the remodeling of the metaphysis, which becomes club shaped and radiologically more dense than normal . The decrease in resorption is accompanied by an increase in both the calcium balance  and the mineral content of the bone. Bisphosphonates prevent bone loss in many experimental diseases. This is the case for various osteoporosis models, such as limb immobilization, ovariectomy, orchidectomy, corticosteroid administration, and other models. Their effect is accompanied by an improvement of the biomechanical properties of bone. As regards tumor bone resorption, bisphosphonates very effectively inhibit tumoral bone resorption both in vitro and in vivo. In vitro, they inhibit the bone resorbing effect of supernatants of various cancers in mice calvaria . In vivo, both the hypercalcemia induced by the tumor  and the development of the metastases  are diminished. The inhibited development of metastases can have various causes. One of these is that, because less bone is destroyed, the area for tumoral expansion is limited. Another explanation involves the self-supporting cycle called the 'seed and soil mechanism' by which growth factors present in bone, such as transforming growth factor-β and insulin-like growth factors, are liberated during bone resorption and thereafter stimulate the multiplication of tumor cells. As a consequence of a decrease in bone resorption, this cycle would be interrupted . Furthermore, bisphosphonates can inhibit the adhesion of tumor cells to mineralized matrices in vitro, both when the cells or the matrix are treated [13, 14]. Finally, there is now evidence that bisphosphonates can decrease multiplication of tumor cells in vitro and can also induce their apoptosis by inhibiting the mevalonate pathway (Fig. 3) . Effect of nitrogen-containing bisphosphonates on the mevalonate pathway by inhibiting farnesylpyrophosphate synthase. HMG-CoA, hydroxymethylglutaryl-coenzyme A; PP, pyrophosphate. Reproduced with permission from Fleisch . The activity of bisphosphonates on bone resorption varies greatly from compound to compound. For etidronate, the first bisphosphonate to be investigated with clodronate, the dose required to inhibit resorption is relatively high (in the rat, greater then 1 mg/kg parenterally per day). Since this dose is near that which impairs normal mineralization, one of the aims of bisphosphonate research has been to develop compounds with a more powerful antiresorptive activity but without a higher inhibition of mineralization. Today, compounds have been developed that are 1–10,000 times more powerful inhibitors than etidronate in inhibiting bone resorption, without a large difference in the inhibition of mineralization. The length of the aliphatic carbon chain is important, and adding a hydroxyl group to the carbon atom at position 1 increases potency. Derivatives with an amino group at the end of the side chain are very active. The length of the side chain is again relevant; the highest activity being found with a backbone of four carbons, as present in alendronate. A primary amine is not necessary for this activity since dimethylation of the amino nitrogen of pamidronate, as seen in olpadronate, increases efficacy. Activity is still further increased when other groups are added to the nitrogen, as seen in ibandronate. Cyclic geminal bisphosphonates are also very potent, especially those containing a nitrogen atom in the ring, such as risedronate. The most active compounds described so far, zoledronate and minodronate, belong to this class of cyclic bisphosphonates. Our understanding of the mode of action of the bisphosphonates has made great progress in the past few years. There is no doubt that the action in vivo is mediated mainly, if not completely, through mechanisms other than the physicochemical inhibition of crystal dissolution, as was initially postulated. These mechanisms are, according to all available data, cellular. Many of these mechanisms have been unraveled and it may well be that several mechanisms are operating simultaneously. The fact that the bisphosphonates act almost exclusively on bone when administered at physiological doses occurs because they have a special affinity to this tissue, where they deposit both in newly formed bone and under the osteoclasts . The action on the osteoclast involves various processes: inhibition of osteoclast recruitment, shortening of the life span of osteoclasts because of programmed cell death (apoptosis) , and inhibition of osteoclast activity. The effect on the osteoclasts leads to a decrease in bone turnover that is secondary to the inhibition of bone resorption. At the molecular level, a great number of biochemical effects have been described over the years. A decrease of acid production, possibly sometimes by inhibiting the osteoclast vacuolar H+-ATPase, an inhibition of lysosomal enzymes, an inhibition of prostaglandin synthesis, an inhibition of protein-tyrosine phosphatases, and an inhibition of matrix metalloproteinases are some examples of these effects. Unfortunately, from the many mechanisms, no single one shows a stringent correlation with the inhibition of bone resorption in vivo when different bisphosphonates of various potencies are investigated. Some new findings have very recently changed the picture. Nitrogen-containing bisphosphonates were found to inhibit the mevalonate pathway [18, 19], by inhibiting farnesylpyrophosphate synthase [20, 21]. This inhibition leads to a decrease of the formation of isoprenoid lipids such as farnesylpyrophosphate and geranylgeranylpyrophosphate. These are required for the post-translational prenylation (transfer of long-chain isoprenoid lipids) of proteins, including the GTP-binding proteins Ras, Rho, Rac, and Rab. These proteins are important for many cell functions. Disruption of their activity will induce a series of changes leading to decreased activity, probably the main effect, and to induction of cell death by apoptosis in several cell types, including osteoclasts. The lack of geranylgeranylpyrophosphate in osteoclasts is most probably responsible for these effects [22, 23]. Of considerable interest is the fact that, when various bisphosphonates of various potencies to inhibit bone resorption were investigated, their effect on the mevalonate pathway corresponded well to that of inhibiting bone resorption . Nitrogen-containing bisphosphonates also block cell growth in vitro of normal human epidermal keratinocytes, used as a model for esophageal irritation, without inducing apoptosis, as seen in osteoclasts . The doses of bisphosphonates inhibiting cell growth also inhibited geranylgeranylation and farnesylation . These results suggest that the basic mechanism of action is similar both in osteoclasts and in the gastrointestinal mucosa. Furthermore, it was shown that some non-nitrogen-containing bisphosphonates closely resembling pyrophosphate, such as etidronate, tiludronate and clodronate, do not act through this pathway. These compounds are incorporated into the phosphate chain of ATP-containing compounds so that they become non-hydrolyzable. The new P–C–P-containing ATP analogs inhibit cell function and may lead to apoptosis and cell death [26, 27]. The bisphosphonates can thus be classified into two major groups with different modes of action. Bisphosphonates prevent experimentally induced calcification of many soft tissues, including among others arteries, kidneys, and skin, both when given parenterally and orally . If administered at a sufficient dose, certain bisphosphonates (such as etidronate) can also impair the mineralization of normal calcified tissues such as bone  and cartilage , as well as dentine, enamel and cementum. The inhibition is eventually reversed after discontinuation of the drug. The inhibition of ectopic mineralization is most probably due chiefly to the physicochemical inhibition of crystal growth, although at least some effect on the matrix cannot be totally excluded. Bisphosphonates are used clinically as skeletal markers in the form of 99mTc derivatives, antiosteolytic agents in patients with increased bone destruction, and inhibitors of calcification in patients with ectopic calcification and ossification. The most common use of bisphosphonates is in diseases with increased bone resorption such as Paget's disease, osteoporosis and tumor bone disease (for a review, see ). Bisphosphonates are now the therapy of choice in Paget's disease. The compound most often used was, and possibly still is, pamidronate, given parenterally. The bisphosphonates decrease bone turnover, often to normal values, they improve the morphology of bone, and they ameliorate bone pain. The effect often persists over a long time after discontinuation of the treatment. Various bisphosphonates have been investigated in osteoporosis, the compounds investigated most thoroughly being alendronate and risedronate. The bisphosphonates not only inhibit bone loss, but can actually also increase bone mineral density. Furthermore, the vertebral and non-vertebral fracture incidence is decreased by about one-half. Bisphosphonates are active in, among others, postmenopausal and elderly women, in men, and in corticosteroid-treated patients. Finally, bisphosphonates are the drugs of choice to decrease bone resorption in tumor bone disease, the most common being pamidronate and clodronate. The therapy induces a diminution of bone resorption, leading to a decrease in hypercalcemia, a decrease of new osteolytic lesions and a decrease of fractures, and leading to an amelioration of pain and an improvement of the quality of life. For further information on preclinical and clinical aspects of bisphosphonates, a book  and various recent reviews [29, 30] are available.